Assistant minister for infrastructure Jamie Briggs says the RSRT makes the Coalition "very uncomfortable". A senior member of the Abbott government has signalled to the trucking industry the demise of the Road Safety Remuneration Tribunal (RSRT) is coming. 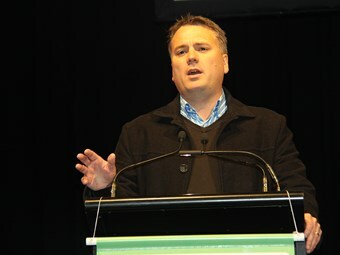 Assistant minister for infrastructure Jamie Briggs used his speech at this year’s national gathering of the Australian Livestock and Rural Transporters Association (ALRTA) to criticise the RSRT and paint it as over-regulation of the transport industry. Briggs told the ALRTA conference the Coalition has "always been very uncomfortable" with the tribunal and then added: "I think you can see the direction the government is intending to take." "We think over-regulation of your industry doesn’t help your outcomes. It just adds cost, it doesn’t improve safety. It just means your businesses are harder to operate," he told attendees. "I think you’ll be comfortable with the approach that the Australian government is taking on this tribunal." Briggs made the comments ahead of the release of findings from a review into the RSRT that employment minister Eric Abetz commissioned late last year. The findings are currently with Abetz but his office will not say when they will be released or when the government will respond to them. While Briggs did not detail when a formal announcement was coming, he did say Abetz would "shortly have some announcements to make about the government’s intentions." The review of the tribunal examined if it was an effective means of addressing safety and whether existing federal or state and territory regulations were more appropriate to improve heavy vehicle safety. A member of the RSRT, Steve Hutchins, also appeared at the conference to explain the work of the tribunal and the contents of its road safety remuneration order that took effect on May 1. The former federal senator and president of the Transport Workers Union (TWU) told the conference it was too early to tell if the order had been successful. "Since the road safety order has been in effect for six weeks or so, its full impact on safety in the road transport industry is yet to be realised," Hutchins says. Former prime minister Julia Gillard created the RSRT in response to findings linking low rates of pay to poor safety in the trucking industry. The tribunal has the power to set pay rates and conditions for truck drivers, be they employee, owner-driver or sub-contractor, throughout the supply chain. It can issue binding road safety remuneration orders if it believes doing so will improve safety. The order that took effect last month mandates 30-day payment terms for sub-contractors and owner-drivers, safe driving plans, written contracts, training and drug and alcohol policies among other measures. The Coalition was highly critical of the RSRT’s creation, with current infrastructure minister Warren Truss dismissing the link between pay and safety when he was in opposition.